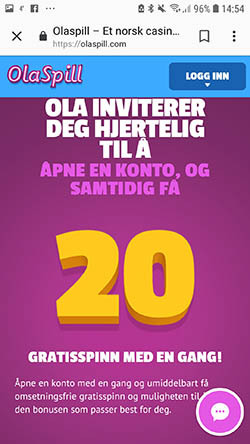 "Only for the Norwegian players"
OlaSpill is the Norwegian sister casino to both accredited Lucky Dino and Casino JEFE and accepts only players from Norway. It’s licensed in Malta and powered by Microgaming (Quickfire version – no download), NetEnt, SGI (including Barcrest, Bally, Williams), and Play n Go, Yggdrasil, Thunderkick, Big Time Gaming, Red Tiger and Pragmatic Play. 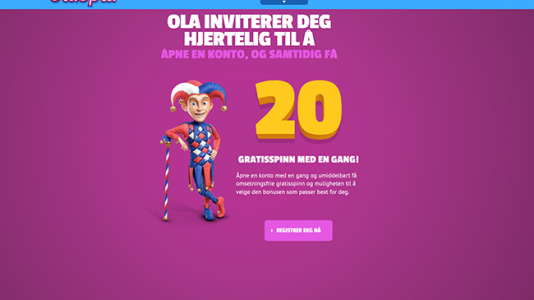 There’s 20 welcoming free spins with no wagering for each newcomer! Ola is one of the most common male name in Norway and spill means game or playing. OlaSpill has an amazing assortment of mobile games – Microgaming, NetNent, Play ‘n Go, Scientific Games, Yggrasil, and Barcrest. Over 300 are available to play. OlaSpill Terms and conditions Apply. If Olaspill is run anything like Lucky Dino, you should not have a problem. Fast payouts – professionally run casino.